The history of pressure-sensitive adhesive (PSA) dates back to the 1920s. Since PSAs are critical to the medical, engineering and construction industries, the demand for the adhesive is still growing. As reported by Tom Brown Inc., the demand for pressure sensitive adhesive tape in 2017 was 39.2 billion square meters. This is expected to rise to 50 billion square meters by the end of 2018. PSA manufacturers continue research efforts to invent novel materials that are required to meet both customer demand and new applications. The application quality of a PSA is determined by three main properties: tack, peel strength (adhesion) and shear strength (cohesion). [1,2] Various blends of reactant monomers such as acrylic acid and 2-ethylhexyl acrylate (2EHA) have been introduced into reaction systems to tailor the physical properties of PSA. The results of these chemistry and reactant changes are observed in the reaction kinetics, Molecular Weight (Mw), and Intrinsic Viscosity (IV) which vary from recipe to recipe. Conventional, off-line analysis on an end-product makes manufacturing and QC complicated and time consuming with a lack of systematic consistency. Introducing continuous, online monitoring of these characteristics leads to better quality and reaction process optimization, improving the R&D cycle and increasing manufacturing efficiency. ACOMP is an online monitoring system that continuously analyzes polymer properties during production and in real time. ACOMP uses a well-known, non-chromatographic method to measure monomer and polymer concentration, intrinsic viscosity and weight average molecular weight. ACOMP’s automation and analysis software handles data acquisition, analysis and reporting in real time. Considering real world reaction recipes for certain, practical applications, various monomers might be copolymerized with 2EHA. Some of these include methyl methacrylate (MMA), cyclohexyl methacrylate (CHMA) and acrylic acid (AA). Among the select monomers of interest, acrylic acid is the most challenging because polyacrylic acid is insoluble in ethyl acetate; however, a certain degree of copolymerization between 2EHA and AA is soluble in this organic solvent. According to the Zimm equation, the differential refractive index (dn/dc) of a material is imperative for Mw calculations. Both the monomer(s) and polymer(s) were characterized by Automatic Continuous Mixing (ACM), a method by which a solute and solvent gradient is measured to determine dn/dc, virial coefficient (A2), and solubility. 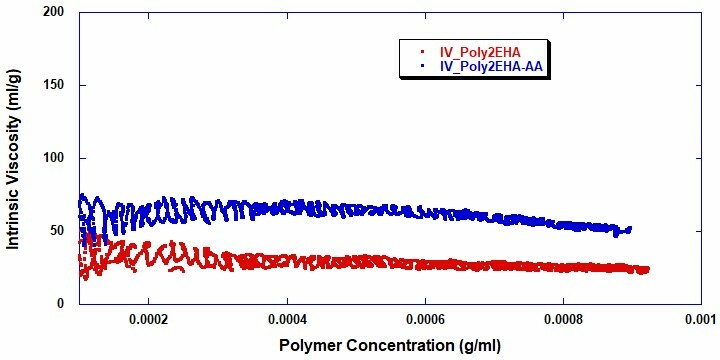 Figure 1 shows that for equal composition of pure monomer and polymer form of 2EHA, the polymer form exhibits a slightly higher voltage response from the differential refractometer. According to these ACM results, the dn/dc of 2-ethylhexyl acrylate and its polymer are 0.106 and 0.134, respectively. 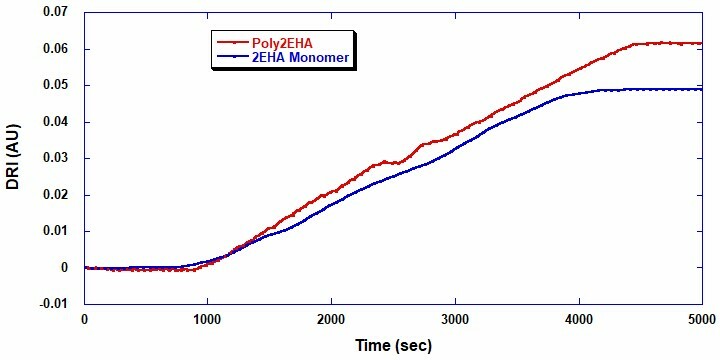 It is noted that the dn/dc difference between monomer and polymer is quite small, which is demonstrated in the reaction data from the homopoly2EHA ACOMP reaction. In terms of the quantitative analysis of polymer concentration or monomer conversion, RI is not a preferable tool for this reaction system; however, it is still necessary to understand these values for an accurate Mw determination. A UV-Vis batch spectrometer was utilized to investigate the absorption wavelength range applicable for the analysis of reaction conversion. The samples of monomer and polymer were prepared at 1 mg/mL in ethyl acetate. 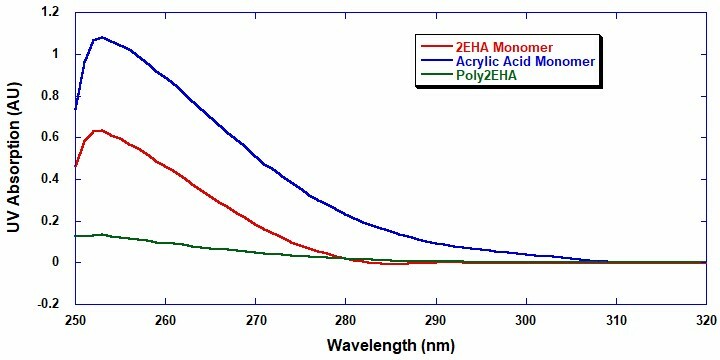 Above the UV-cutoff wavelength of ethyl acetate, which is 255 nm, figure 2 shows that 2EHA has a strong absorption peak from 255 nm to approximately 287 nm. Conversely, acrylic acid has a broader peak up to 310 nm with AA exhibiting a higher extinction coefficient than 2EHA. This means copolymer reactions can be quantitatively analyzed by UV in terms of the conversion and composition of each monomer on the premise that the mass ratio of 2EHA to acrylic acid is 1:1 (both conversion and composition of each monomer). The UV range from 288 nm to 310 nm is useful when determining the conversion and concentration analysis of AA. Using the UV absorption range from 255 nm to 287 nm, the conversion and concentration of 2EHA can be solved. The next section lists the UV wavelengths chosen for ACOMP. The ACOMP system used a UV/Vis and a differential refractometer for measuring monomer and polymer concentrations. The UV/Vis uses four wavelengths, 260 nm, 270 nm, 290 nm and 310 nm, for measuring the absorption of monomer. A single capillary viscometer and a 5-angle light scattering were used for measuring intrinsic viscosity and weight average molecular weight, respectively. ACOMP extracted a sample from the reactor recirculation loop at the rate of 0.25 mL/min. Next, the reactor sample was diluted 150x with ethyl acetate, the same solvent used in the reactor to condition the polymer sample to necessary concentrations that reveal the desired polymer characteristics. Two batch copolymerizations of 2-ethylhexyl acrylate (2EHA) homopolymerization and 2EHA/AA were conducted using ethyl acetate (EA) as a solvent at a constant temperature of 60 ˚C. The reactions started with 22.7% total monomer concentration by mass and 0.36% initiator (AIBN). The reactor contents were purged with Nitrogen for one hour prior to the start of the polymerization. Light Scattering at 45°, 65°, 90°, 135° and 145°. 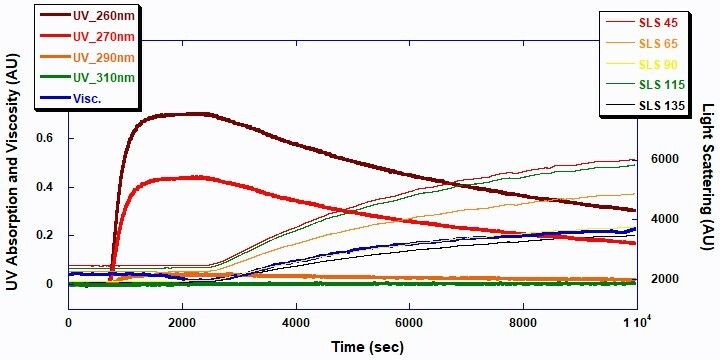 Figure 3 shows ACOMP raw signals versus time. The four UV signals decrease in a first order exponential manner as the double bonds in the monomer break to form polymer. The viscosity and 5-angle light scattering signals increase with the polymerization as the molecular chains of the polymer increase in mass. 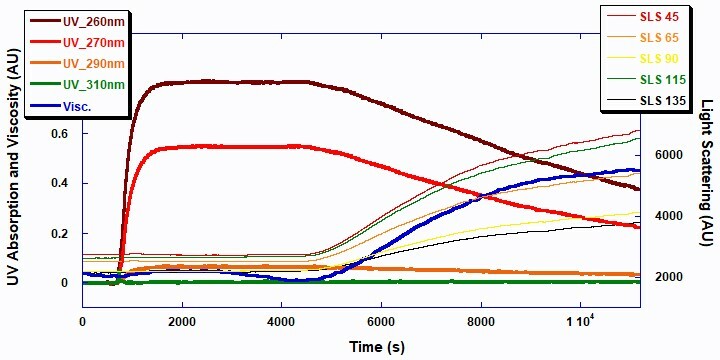 Figure 4 displays raw ACOMP signals from the 2EHA and AA copolymerization reaction versus time. 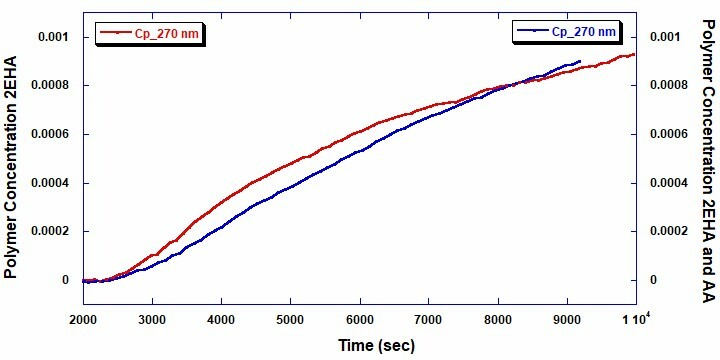 The polymer concentrations shown in Figure 5 are measured using the UV/Vis detector at 270 nm. The polymer concentration increases proportionally as monomer concentration decreases and is equivalent to monomer conversion into polymer. The information derived from this conversion can present details about the reaction kinetics and reactivity of the monomers in both the homopolymer and copolymer reactions. Figures 6 and 7 show the intrinsic viscosity and weight average molecular weight vs polymer concentration. 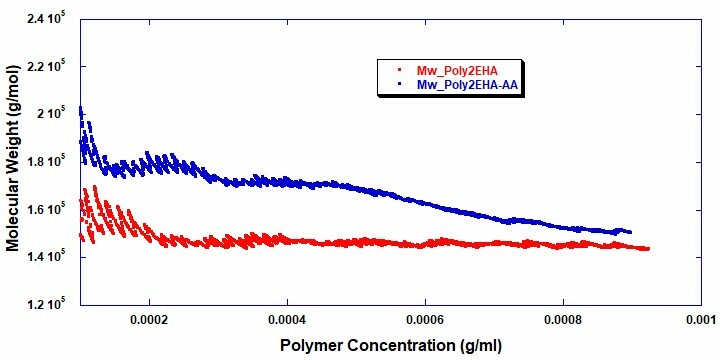 Note that in the copolymerization of Poly2EHA-AA, both the Mw and Viscosity begin at a higher value than that of only the homopolymerization of Poly2EHA. Observable in the copolymerization is an abrupt change in the weight average molecular weight after the consumption of AA monomer. After this point in the reaction, there is no longer any AA to convert into the polymer chains, thus, the remainder of the polymerization produces homopolymer 2EHA. In comparing the ACOMP analysis method with that of standard characterization methods, the synthesized polymer end products were characterized by Gel Permeation Chromatography (GPC). The GPC result for the homopolymer 2EHA is very close to that of the ACOMP result. This means the proposed method of using ACOMP for monitoring polymerizations can provide an equivalent, realtime, online characterization of molecular weight. The GPC result of copolymer 2EHA-AA, however, is significantly higher than the ACOMP analysis. This result is due to the early incorporation of AA to the Poly2EHA which increases the hydrodynamic volume of the molecules. This caused a higher GPC result than the real weight average molecular weight of the polymer, as directly measured by ACOMP. The polydispersity of the product also reflects the incorporation and then exhaustion of AA early in the polymerization that therefore results in an abundance of small chain 2EHA homopolymers. The free radical polymerization of 2-ethlyhexyl acrylate and 2-ethylhexyl acrylate/acrylic acid reactions are easily monitored and analyzed by ACOMP. The results shown in Table 2 indicate that the addition of 8.7% acrylic acid does not significantly affect the weight average Mw of the final product once it is completely consumed, but it causes an overall 112% increase in intrinsic viscosity due to an increase of the hydrodynamic volume. ACOMP is a powerful tool for the analysis of numerous polymerization reactions from the R&D to the industrial scale. The system not only contains detectors but has many hardware and software sensors aimed at preventative maintenance and self-aware capabilities. ACOMP can also be customized for a number of chemistries and production environments ranging from laboratory R&D to full scale industrial manufacturing. Reed, W.F. “Automated Continuous Online Monitoring of Polymerization Reactions (ACOMP) and Related Techniques.”Encyclopedia of Analytical Chemistry, 2013, 1-40, DOI: 10.1002/9780470027318.a9288. Christopher L. Lester, William L. Bottorf. “Acrylic Pressure Sensitive Adhesive Having Controlled Placement OF Functional Group” pstc.org.